WHAT COULD GO WRONG? 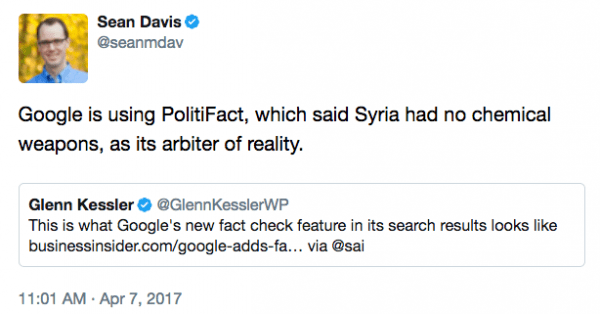 Google is wading into the battle against online fake news and adding a fact check to its search results. The Californian tech giant announced on Friday that it is rolling out globally a feature in its search and news results that will assess the authenticity of information shown. Google isn’t doing this fact-checking itself: Instead, it’s relying on respected independent fact-checking organisations like PolitiFact and Snopes to provide the info.